The sophisticated Quartz Mountain Residence is a 4,700 square foot single family home that sits almost as a sculpture in the desert landscape. Modern in its design, the home boasts a material palette of earth, wood, stone and glass. The rammed-earth walls dance throughout the building helping to enhance the long horizontality of the building with its striated layers of compacted earth. A “cozy” feeling is described for this house by the architect, Brent Kendle. Undoubtedly, the use of rammed earth and wooden ceilings help to offset the cold tones of limestone floors and brick that create the other planes of the home. This evocative, mid-century styled home also boasts an abundance of natural light. Floor to ceiling glazing and large sliding doors invite the colors of the desert into the home at all hours of the day. Overhead skylights also help to illuminate the interiors in order to keep energy consumption low. Overall, the home can be seen as a very efficiently designed thermal engine. The rammed-earth walls help to control the temperature of the home – appearing cool during the day while emitting the passive heat gained through the day’s sunlight during the night. It could be said that the long-term energy savings of this home will be as enjoyable as its infinity pool overlooking the desert. The sophisticated Quartz Mountain Residence is a 4700 square foot single family home that sits almost as a sculpture in the desert landscape. Modern in its design, the home boasts a material palette of earth, wood, stone and glass. The rammed-earth walls dance throughout the building, helping to enhance the long horizontality of the building with its striated layers of compacted earth. Undoubtedly, the use of rammed earth and wooden ceilings help to offset the cold tones of limestone floors and brick that create the other planes of the home. This evocative, mid-century styled home also boasts an abundance of natural light. A “cozy” feeling is described for this house by the architect, Brent Kendle. Floor to ceiling glazing and large sliding doors invite the colors of the desert into the home at all hours of the day. Overhead skylights also help to illuminate the interiors in order to keep energy consumption low. Overall, the home can be seen as a very efficiently designed thermal engine. No shortage of natural light here. It could be said that the long-term energy savings of this home will be as enjoyable as its infinity pool overlooking the desert. The rammed-earth walls help to control the temperature of the home – appearing cool during the day while emitting the passive heat gained through the day’s sunlight during the night. 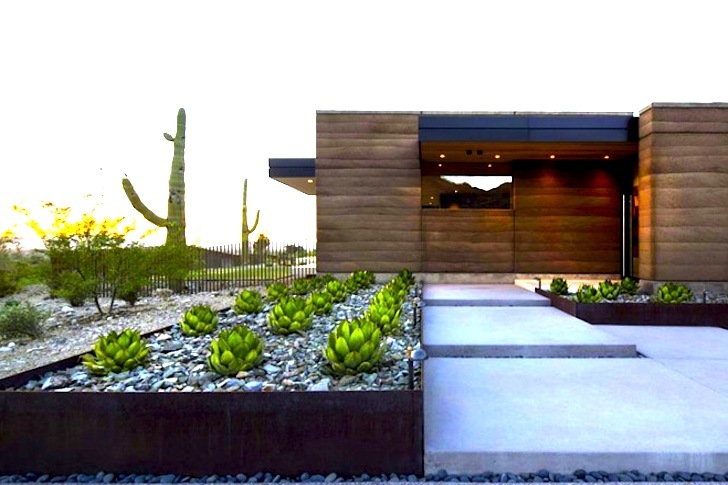 We love this rammed earth interpretation of the large ranch house typology.